Tenjat is Central American in appearance, looking as if he could be Mayan in ancestry (though Drift is set in another world that doesn’t use the terms of our world) so we knew our options of stock photography might be limited—often, it is difficult to find stock photos of non-white teens to use. But we were hopeful that we could find a teen model who would love to be on the cover of a book! Where we got held up, though, was the clothing. The farmers on Tenjat’s island wear simple homespun tunics, which would be hard to acquire. Add to that the fact that Tenjat is a Handler, a defender of his island (Handlers are the island’s military force, if you will), and the task became nearly impossible. Handlers wear a skin-tight outfit that appears like fish skin, and though it’s easy to imagine, I worried about trying to depict it in a realistic fashion—anything we made would not look quite right. The clothing issue combined with the fact that we were not able to find the right model within our time frame brought us to look for an alternative, much as we loved the mock-up art that the designer proposed with a model. As a small publisher, our budget only goes so far, so when our resourcefulness isn’t enough, we must be able to change direction swiftly. One thing that remained constant though all of the designer’s iterations of the cover, and which is front and center in the final, is the presence of the turtle. I love how the designer has hinted at the way the turtle islands work in the book (each island in this world is actually a giant turtle, and the turtle must be well-nourished for the land above to be able to feed the people who live there; Tenjat and his people must try to find places for their Turtle to feed where larger islands won’t try to invade them). So, what could we do? Illustration wasn’t an option. 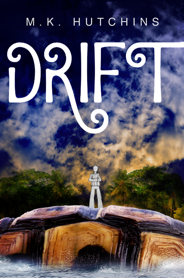 Drift is a solidly young adult book—choosing to illustrate it would make it look a bit younger than we were hoping for. And the turtle that the designer had proposed for the model-centric covers was really fascinating. What could we do with that? We had one turtle-centric cover possibility, but there was something that just wasn’t right about it: the pattern in the background was Aztec, not Mayan. We could have found a Mayan pattern, but we didn’t want to visually tie the book too closely to Mayan culture, because it’s a completely different world—it has worldbuilding influences from Mayan culture, but it is not representative at all of Mayan culture. But we loved the gorgeous deep blue sea and the turtle, and melding those two components made for an even better cover. Combine that with a more interesting font, and we have what we now know as the final cover of Drift. And be sure to take a look at the hardcover when it comes out, as this gorgeous turtle wraps around the whole cover. What kind of world is contained within the jungles and mountains on that turtle’s back? 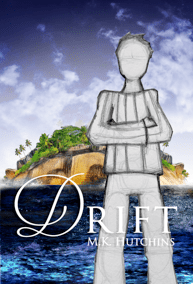 You’ll have to read Drift to find out! Check it out in May! So until May comes, let your imagination drift away to what it’d be like if you lived on a turtle’s back. We’d love to hear your thoughts!